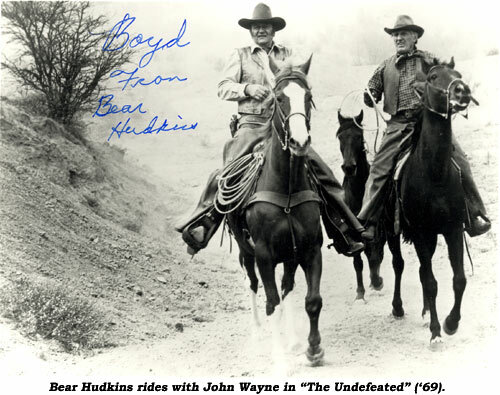 When you watch classic action filled westerns and see a ferocious wagon wreck, or turnover as they are called in the business, chances are real good you’re seeing the expertise of Bear Hudkins, one of the best wagon men ever to perform in films. 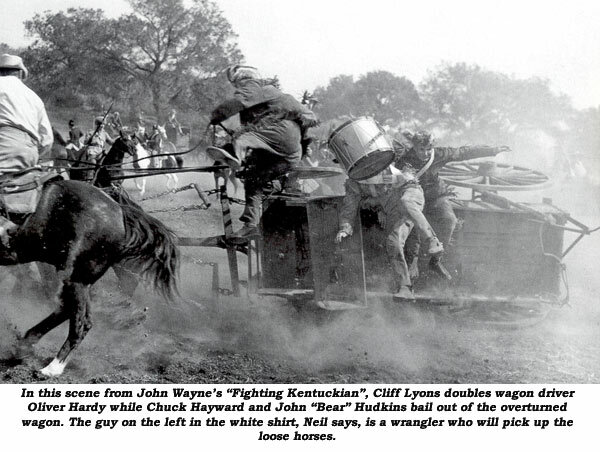 Wagons were not Bear’s only stunt and he, along with other stalwarts of the stunt profession, did horsefalls, fights, transfers, saddlefalls, doubling for actors and anything else the script called for. Bear was one of the few stuntmen in the elite group of professionals that got all the action done for John Wayne movies. To belong to this bunch of stuntmen you had to be tough, good at what you did and exceptionally talented in the action end of filmwork. Bear came to California from Lincoln, NE, with a football scholarship to U.C.L.A. 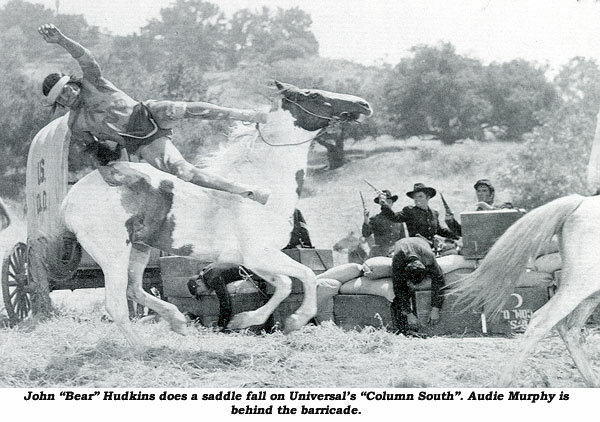 His uncles were already involved in the film industry with the famous Hudkins’ stables. They supplied most of the livestock, wranglers and wagons for the hundreds of westerns being shot. When Bear’s father passed away in Lincoln he left 10 children; so Bear was forced to go to work to help his mother support the kids. His first job was as one of the troopers in Errol Flynn’s epic film, “They Died With Their Boots On”. Bear quickly rose through the ranks to become accepted by such already established stuntmen as Yakima Canutt, who soon began using Bear on a regular basis. It was not long before Bear had racked up a list of impressive credits and a reliable, no nonsense reputation as a man who came to work and got the job done in a spectacular way. Tragedy struck in 1948 while Bear was performing a dangerous drag on “Fort Apache” in Monument Valley. A horse fell on Bear and broke his back. The shot is plainly visible in the film. Bear was laid up for about a year but then immediately resumed his career and there has been no let up to this day. Bear was Spencer Tracy’s double for most of Spence’s later career and co-ordinated the hilarious stunt filled comedy, “It’s a Mad Mad Mad World”. 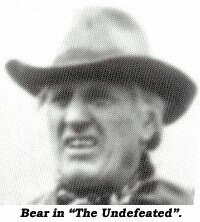 Some other major films Bear has been involved in as either stuntman or stunt co-ordinator include “Rio Lobo”, “The Undefeated”, “Paint Your Wagon”, “The Professionals”, “Hawmps”, “Wings of Eagles”, “The Alamo”, “Outlaw Josey Wales”, “Salome, Where She Danced”, “The Green Berets”. “The Younger Brothers”, “Ten Gentlemen From West Point”, “Oklahoma Crude”, “The Searchers”, “Monte Walsh”, “Rio Bravo”, “Rio Grande” and hundreds more. All top caliber films and believe me, you do not get hired for these kinds of jobs unless you are the best. Bear Hudkins is quickly acknowledged as being one of the best stuntmen Hollywood has ever seen. I first met Bear in 1964 on location in Gallup, New Mexico, for Troy Donahue’s “A Distant Trumpet”. John “Bear” Hudkins was one of the last of a truly unique breed of men...an all around, double tough, stuntman.